Take the stress out of holiday meal planning with this easy vegan Thanksgiving menu! With these recipes, you’re guaranteed a meal everyone will enjoy, from appetizers to dessert. Every year I start thinking about Thanksgiving as soon as Halloween is over. Actually, that’s not the truth. I start thinking about it in early October. There are certain classic recipes that everyone expects to see on the holiday table, like mashed potatoes and cranberry sauce. And others may be family favorites or regional classics. These are some of my go-to easy and delicious Thanksgiving recipes. Maybe you’ll decide to make all the dishes or just a few. But either way, I hope I can help make planning your holiday dinner a little easier. Let’s start our vegan Thanksgiving dinner with some appetizers! First of all, we need something cute and festive. This Turkey Guacamole Dip from Cara of Fork & Beans is just perfect! And we can also serve some delicious cheese and crackers for our guests to much on. I highly recommend you pick up some Miyoko’s Kitchen cheeses from your local specialty shop or online. I like to place a large order and have it shipped to me. Then grab some Mary’s Gone Crackers. They are my favorite, and my guests always enjoy them. I also make some Vegan Stuffed Mushrooms if I want to have a hot appetizer. 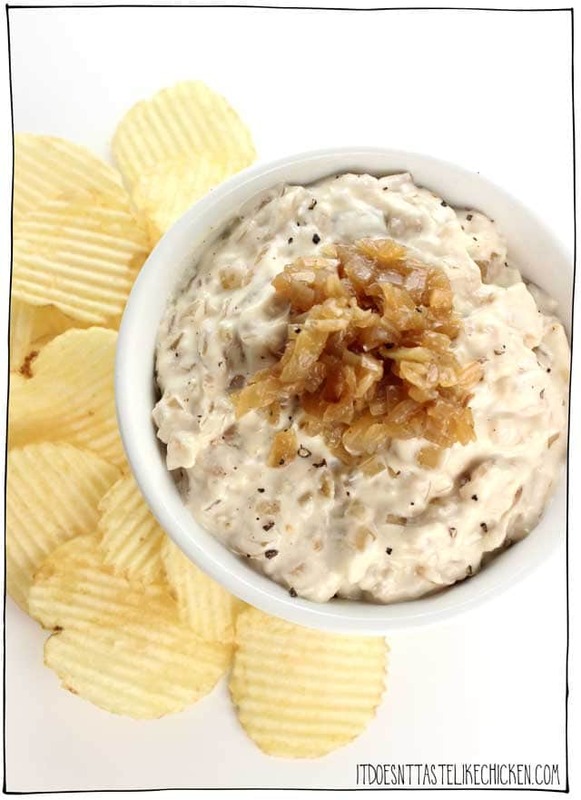 And Vegan Caramelized Onion Dip, like this one from Sam at It Doesn’t Taste Like Chicken, is always a hit. At this point your friends and family may be ready for a holiday cocktail. How about a Roasted Apple Tom Collins from Becky of Glue & Glitter? It sure looks delicious to me! And if you’re in the mood for something else, check out the amazing collection of beverage recipes Becky has created. It’s time to move on to the main event of this vegan Thanksgiving, the entree! I know what you’re thinking: what are we going to serve instead of a turkey? These days there are many options your can purchase from your local supermarket like holiday celebration loaves and mock meats. But it’s really easy to make your own Thanksgiving entree. I like to make Lentil Meatloaf Muffins. You can use cooked lentils to save time. Or for a loaf, check out this Mushroom-Walnut Meatless Loaf from Melissa of Vegan Huggs. With that glaze, I don’t know how anyone can resist going back for seconds. If you’re going to serve a salad as part of your Vegan Thanksgiving menu, make it something festive. I really like this Pomegranate and Apple Kale Salad because it’s delicious and adds a lot of color to your plate. Plus it only takes a few minutes to make and can be prepared ahead of time. Or try one with seasonal vegetables like this Roasted Butternut Squash Salad. Next up is my favorite part of this Vegan Thanksgiving Menu Plan, the side dishes. First we’re going to need some mashed potatoes. I have been making Instant Pot Mashed Potatoes for years. They are the easiest mashed potatoes you’ll ever make, and they turn out perfectly every time. In addition, you can keep them warm in the Instant Pot so no one has to eat cold potatoes. I serve them with Easy Vegan Mushroom Gravy on the side. Not a fan of mashed potatoes? How about some No Oil Crispy Roasted Potatoes from Mel of A Virtual Vegan instead? Or if you don’t care for mushrooms, try Mashed Potatoes and Onion Gravy from Sarah of Fried Dandelions. It’s a classic. And speaking of classics, we need some Maple Cinnamon Cranberry Pear Sauce from Jenn of Veggie Inspired. Or for something a little different, I love making Fresh Cranberry Apple Relish. My mom used to make it, and I still love it. A variety of vegetable dishes are always welcome as part of a vegan Thanksgiving. My family loves Brussels sprouts, and it’s not Thanksgiving without them. I like to throw in another vegetable and serve Roasted Brussels Sprouts & Butternut Squash. Sauteed Fresh Green Beans with Mushrooms is also a favorite. And it’s so quick and easy to make. White Wine Roasted Vegetables is another delicious choice. Or if you want to make a vegan version of a traditional casserole, try Jessica in the Kitchen’s Vegan Green Bean Casserole. Now this next dish may seem a little less traditional, but trust me, you’re going to want this on your table. May I present to you, Smoky Mac Stuffed Sweet Potatoes from Jackie of Vegan Yack Attack! However, if you’re not crazy about this combination, you can make two separate dishes instead. I really love both Mashed Sweet Potatoes and Mac and Cheese with Garlic Spinach. And one of the most popular recipes I serve my friends and family is Wild Rice Salad with Apples and Pomegranate. Did you save room for dessert? If you want to go with a traditional dessert with some flair, I suggest trying No-Bake Pumpkin Swirl Cheesecake from Dianne of Dianne’s Vegan Kitchen. Vegan Pumpkin Pie from Marina of Yummy Mummy Kitchen is also a great choice. And Isa Chandra Moskowitz’s Pumpkin Cheesecake with Pecan Crunch Topping is a winner year after year. Or if you want to go with something lighter, try my Pumpkin Pie Chia Pudding, either layered with fruit or coconut whipped cream and mini chocolate chips! And don’t forget to give back this holiday season to those less fortunate. I like to contribute to my local food bank. And I also Adopt a Turkey from Farm Sanctuary. Turkeys are for hugging, not for eating! If you make any of these vegan Thanksgiving recipes, or any of the other recipes on the website, I would love to see your creations! Use the hashtag #veggiessavetheday on Instagram and tag Veggies Save The Day so I don’t miss seeing what’s cooking in your kitchen. In addition, you can post your photos on the Facebook page Veggies Save The Day or in the Facebook group. Amy Katz is a vegan recipe developer. She loves sharing simple healthy plant-based recipes that home cooks of all levels will enjoy. Her gluten-free vegan recipes have been featured on NBC News, Parade, VegNews, BuzzFeed, MSN, Greatist, PureWow, Brides, LIVEKINDLY, Insider, and Brit+Co. This looks like a lovely supper menu. Thank you for including my cocktail recipe! I love your cocktail recipes, Becky! Can’t wait for Thanksgiving! It has always been my favorite food holiday. These days, I eat a very different meal than I used to, but it’s still delicious food! Thanks for including my cranberry sauce! Your cranberry sauce is so amazing! Everyone is going to love it. Thanks so much for including my cheesecake! It’s a beautiful dessert, and I love it that it doesn’t need to be baked! Thanks Melissa! Everyone loves your meatless loaf! Thank you for supporting Farm Sanctuary by adopting a turkey!! I can speak for everyone and say we are so grateful for people like you who are taking action and spreading the word!! Happy Thanksgiving!! I love Farm Sanctuary! Happy Thanksgiving, Lisa!